It has recently came about that local Gypsies in the Epping Forest area (and other too), are being caught, cooked and eaten. They are being sold to people for £5, which is illegal. 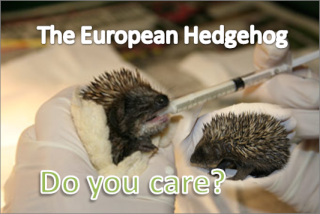 This is shocking news, and because Hedgehogs are dying out it makes the matters even worse. Please do not buy the Hedgehogs. Not only is it illegal, but the animal may have gone through lots of suffering. There may also be issues to do with health and safety, many Gypsies do not have a licence to kill these creatures and may not have prepared the food properly. This is disgusting - I knew it was a practise that went on years ago but I didn't think it still did now. Hedgehogs have enough to contend with without being someones dinner. Hedgehogs have enough on their plate with out people trying to eat them!